The emergence of Do-It-Yourself (DIY) science movements is becoming a topic widely discussed in academia and policy, as well as by the general public and the media. While DIY approaches enjoy increasing diffusion even in official research, different social actors frequently talk about them in different ways and circumstances. Interaction and negotiation processes amongst actors (e.g. policy makers and DIY communities) define the premises upon which different conceptualisations of DIY science are deployed. In this paper we offer a framework for analysing the discourse on DIY science. Our study consists of a field research of three spaces active in DIY science premises, two dedicated events of the DIY community, and an auto-ethnography in the field of DIY biology. By relying on the theory of social worlds/arenas (SW/A), we collected data on how notions of DIY science are constructed by different social actors and how conceptual borders are built or are likely to shift, resulting in multiple possible SW/A mappings. We conclude that each and every conceptualisation of DIY science cannot stand independently from the situatedness of its multiple contexts, therefore making its usage in policy making and governance particularly complex. DIY science is gaining a great deal of attention both among practitioners and in the media. 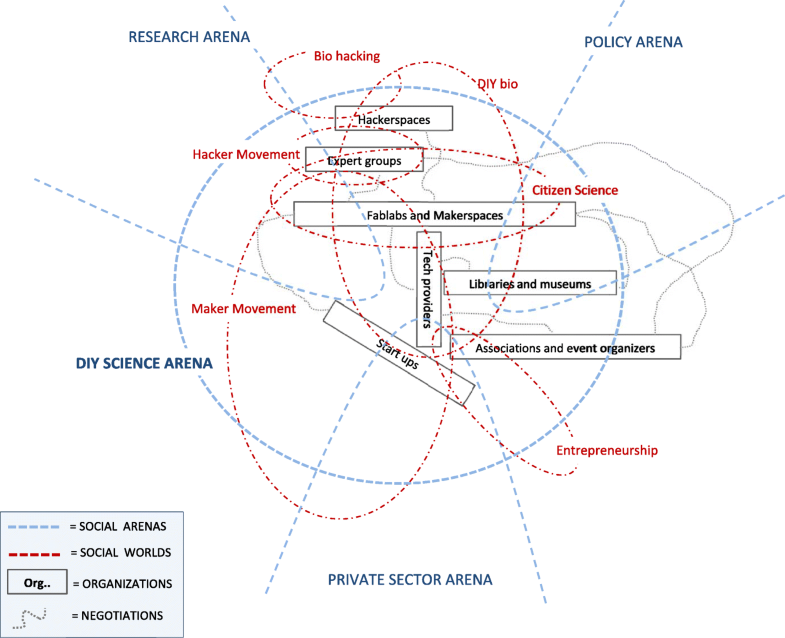 The locations of DIY science are various and range from small groups of tech enthusiasts to large online communities that share scientific objectives and outcomes, organised into local makerspaces, Fablabs, classrooms, universities and museums, public libraries and private enterprises (Nascimento, Guimarães Pereira, & Ghezzi, 2014). Such heterogeneity does not only result in different ways of practicing DIY science, but also in differences in its conceptualization. Opportunities of DIY science typically gather a variety of social actors, making it difficult, if not impossible, to create fixed and unique categorizations about the phenomenon (Alper, 2013). Quite on the contrary, actors interact in many different ways, in different virtual or physical spaces, being moved by different beliefs, values, interests and visions, not least on the developments of DIY movements as such. Our argument is that different social actors articulate discourse about DIY science in fundamentally different ways, pointing us to the existence of multiple understandings and, consequently, practical implementations of DIY science. To test this hypothesis, we direct our investigation to the level of social action where individuals share participation and commitment to DIY science, relying on the theory of social worlds/arenas (SW/A) to explore how “various issues are debated, negotiated, fought out, forced and manipulated by representatives” (Strauss, 1978, p. 124). Mapping SW/A renders visible these patterns of commitment and action and helps elucidating how discourse becomes performative in generating certain conceptualizations of DIY science against others. While the origins of DIY can be traced back to the 60s and the 70s, the recent advent of the digital era and the Internet have drastically transformed the access to information and technologies, attracting greater audience to a number of newer sociotechnical issues, such as 3D print or genome editing, which often carry with themselves the promise of an extended participation to science. Such tendency has surely shortened the perceived distance between professional scientists and the general public,1 putting upfront questions on how such emerging social practices are going to affect social life at large, and, indirectly, value systems to think about science. As an example, CRISPR based technologies are offering once unprecedented opportunities for genome editing that frequently raise fervent reactions in the media: a 2015 Guardian piece entitled “Human gene editing is a social and political matter, not just a scientific one2” reminds us of the social and ethical dimensions brought about by the emergence of new technologies. Yet, DIY science is directly and indirectly referred to with multiple understandings, beliefs, and expectations, entangling different views on themes such as innovation, ethics, new technologies, education, employment, and risk assessment. This paper offers a framework to analyse the heterogeneity and complexity of DIY science by looking at how its actors articulate discourse about it. Following from such discourse analysis, we offer two, among many others, possible mappings of the social worlds and arenas in which DIY science is situated. Our inquiry into DIY science projects, experiments, online and offline communities, and laboratories allowed us identifying (i) the main social actors populating DIY science (and consequently, their social worlds and arenas), and (ii) how the actors’ articulation of discourse may result in different mappings of DIY science. We studied DIY science with a dual approach: first we conducted field research of three spaces across Europe active with DIY science projects and two technology and innovation international fairs where communities of DIY scientists and institutional representatives meet. Second, we engaged at the micro level with our local community by setting up a DIY science project in the field of biology. Section two deals with the notion of DIY science and its origins, as well as with the heterogeneity and variety of the DIY settings. It also points out the substantial lack of studies on how the actors of the DIY panorama form and negotiate their perspectives, as well as organize their social life. Section three is an account of social world/arenas theory and how it is meaningful for our scope. Section four describes the methodology we adopted for our social research, made of an auto-ethnographic and an in-field research phases aimed at identifying the actors and their interactions and practices within different worlds and arenas. An analysis of such arenas is offered in section five, that puts the basis for further discussion even on some seemingly contradictory characteristics of DIY science. The expression “do-it-yourself”, abbreviated “DIY”, emerged in North America after World War Two initially referring to the “making” and “crafting” associated with the spread of hobbysm as a social practice (Gelber, 1999). Few publications from that time3 testimony the association of DIY with individual well-being and self-production, with particular focus on the construction and repair of household objects using common hands tools. From that perspective, DIY was at first identified with the physical activity of making, trait that we find again today with the spread of the Maker Movement (see e.g. Chen & Wu, 2017a). In relation to hobbies and leisure, Menninger (1942) described how frequently the physical activity of making “may not be unrelated to a similar type of satisfaction gained from athletic activities, hiking or dancing” (p.123) as well as that “in not a few activities, maximum satisfaction is gained from the participation of the individual with a group, [which is often] a prerequisite to carrying on the activity”(p.128). It thus seems that, in an early conceptualization, DIY allowed individuals and groups to freely initiate and conduct projects with a direct observation of their work and consequent satisfaction about their accomplishments. Beyond self-taught manufacturing, the expression was progressively appropriated in the language of the counterculture of the 60s and 70s, this time also implying a moral critique to the formal education systems, and more generally the consumerist society (Smith, 2014). Hence, DIY became also a mean for protest together with the spread of grassroots political activism. Duncombe (1997) describes DIY as “a critique of the dominant mode of passive consumer culture and something far more important: the active creation of an alternative culture. DIY is not just complaining about what is, but actually doing something different” (p.117). At least to some degree, this understanding seems to resonate with “prefiguring and constructing alternatives to existing institutions” (Day, 2005, p.19). In the 80s and 90s, the DIY culture evolved towards new possibilities of media production, made more accessible and less expensive with the advent of the digital era, offered (especially within the nascent punk, free party and rave cultures in the UK) feasible possibilities also in the arts and crafts, politics and not least, science (Lowndes, 2016). Today, recent technological developments (among which mobile computing) are allowing even newer practices, unimaginable just two decades ago: a 2017 Nature article entitled “The DIY electronics transforming research” (Cressey, 2017) described how the impact of low cost microcontrollers and single board computers is changing the way research is nowadays conducted, in computer engineering particularly. Raspberry Pis, Arduinos and similar devices are nowadays commonly used in contexts such as gene editing, marine research, drug design and automation engineering, not least even by scientists from the academia: in 2017, 14 million of Raspberry Pis boards were sold worldwide.5 Such diffusion, Cressey argues, greatly reduces the amount of preliminary knowledge necessary for people normally external to the academia to conduct experiments, or in other words, to “do science”. Drawing from our collective imagination of Galileo and Newton, we are familiar with the figure of independent scientists mainly moved by a pure pursuit of knowledge and used to set up experiments to verify their theories of nature. Increasing consensus is forming that a similar curiosity-driven approach to research is coming back, albeit on other grounds, also thanks to the spread of DIY methods (Dance, 2017): expensive experiments that once required institutional or private founding are now replicable with a fraction of the resources, while, at the same time, peer communities still offer technical support and expertise (Kuznetsov & Paulos, 2010). Still, what different actors more precisely mean when they refer to DIY science? Accounts on the meanings of DIY science are scarce in the literature. While Citizen Science has been described as a collective scientific practice (Cooper et al., 2014; Morzy, 2015; Newman et al., 2012), DIY science rather more broadly refers to the process initiated by individuals and groups that tinker, hack, fix, and recreate objects and systems out of their own interest, curiosity or need, and openly share results and outcomes in their networks (Nascimento, Guimarães Pereira and Ghezzi, 2014). Not only amateurs, tech-enthusiasts and hobbyists appear among the actors of DIY science, but also an increasing number of professional scientists, teachers and university professors (Haklay et al., 2018). Such constitutive heterogeneity makes difficult and arbitrary to outline the boundaries of DIY science. Much of the available information on the topic typically builds upon the analysis of instances of the Maker Movement as it frequently offers a physical space for DIY science projects (Austen, 2013). However, in order to identify the broad spectrum of DIY science manifestations, we cannot a priori exclude additional circles such as communities of practice, expert groups, online platforms, or simply, private garages. In this premises, additional actors act upon different concerns that typically entail different understandings of DIY science. For that reason, we designed our research study to be as inclusive as possible of such variety (see Perspectives on DIY science section). We additionally performed a search on Scopus6 to assess and confront meanings of DIY science in the academic literature and check the thematic angles from which DIY science is tackled. After reviewing a pool of 29 papers, we classified them according to their disciplinary angle and main area of interest. The papers are summarized in the following table (Tables 1 and 2). What to make of makerspaces: Tools and DIY only or is there an interconnected information resources space? In approximately a quarter of all papers DIY science is tackled from the perspective of the Maker Movement and, in fewer cases, of Citizen Science. These contributions examine the broader context of DIY and maker practices by assessing how these latest enrich and diversify technology development. Therein, the Maker Movement is typically framed as a transformation “changing innovation, culture and education not only through open Internet technology and digital things, but also through physical things such as hardware designs, sensors, and networking devices” (Lindtner et al., 2014 p. 147 in Chen and Wu, 2017a, b). Another eight papers report on real case examples where DIY methods have been employed for the set up and conduction of content specific experiments. Despite being mostly technical, in more than one case few considerations are drawn about the DIY paradigm and its potential in science experiments. In six other papers DIY science is conceptualized in the context of biology (frequently through the expression “DIY Bio”) whereby “a new era of DIY Biology originally evolved as a non-institutional pursuit, with practitioners – many of whom having little or no formal training either due to a lack of infrastructure, funding or indeed opportunity – operating out of garages or modified kitchens” (Sleator, 2016a, b p.278). Amateur biologists have also been defined as “individuals who conduct biological experiments as an avocation rather than a vocation”(National Science Advisory Board for ger, 2011). All retrieved articles on the topic are concerned with reviewing the emergence and characteristics of the phenomenon, in some cases reporting upon few real case examples. Other common aspects of investigation are the implications of DIY methods in learning and skills development,7 and, to a lesser extent, the ethical consequences of the rise of DIY approaches and perspectives on the study of public participation to science. Together with the topic of DIY science reverberating from different thematic and disciplinary angles, increasing literature reports on the growing suspicion with which science experts are being regarded by the general public (Gauchat, 2012; Lave, 2012; Wynne, 2007). As trust in mainstream science deteriorates, “individuals begin to give more weight to personal accounts and information shared within networks of peers” (Berditchevskaia et al., 2017, p. 1). On their side, scientists themselves are beginning to realise the scientific relevance of DIY practices,8 and examples of engagement in scientific research and dissemination are becoming more frequent outside the academia, either in the private sector or in own business (Cressey, 2012; Fritsch & Krabel, 2012). The DIY paradigm welcomes anyone to get involved and perform own research without the need for formal qualifications, and at the same time, it also enjoys good reputation within the scientific community (Wylie et al., 2014). As these practices become more integrated into the formal science system, scientists themselves are determined to improve and refine them in the light of their internal challenges (Garbarino & Mason, 2016). As a result, alternative scientific approaches are increasingly looked at by institutions and the academia not just benevolently, but also with indirect expectations about the scientific value that DIY science can lend to societal challenges (Lindtner & Lin, 2017). References to DIY science are not rare in policy making9 and the academia, with more and more frequent cases of DIY lab set up by researchers to contrast the bureaucracy and rigidity of universities10. However, since DIY communities are not moved by a single goal, misconceptions about DIY science are around the corner: for instance, while amateur biology movements worldwide have shown a huge variety of research interests (Seyfrie et al., 2014), universities and policymakers are rather focused on a narrow definition and regulation of the ‘connected risks’ (Nature, 2013). Controversies arise widely when ethical issues become evident in the debate: should open genomics be regulated? What are the moral aspects of synthetic biology (see e.g. James, 2015)? According to Clarke (2003), new methods are needed to empirically investigate the increasing complexity and heterogeneity of modern societies. In a ‘postmodern’ era, she argues, all knowledges are socially and culturally produced and, for that reason, they need to be conceptualised as situated, i.e. produced and consumed by particular groups of people, “historically and geographically locatable” (p. xxv). The etymology of ‘situation’ has roots in the Latin situatio, literally “place, position, or location”13 and reminds of the physical connotation of the term. However, other than the temporal and spatial dimensions, Clarke asserts that situations can have multiple other orderings such as technological, work, sentimental, moral, and aesthetic, and that the units of analysis are the collective commitments and actions taken by the participants of a certain organisation (citing Strauss, 1978). For that reason, the analytical focus needs to go beyond the sole domain of social action, somehow integrating a broader perspective on elements of negotiation and discourse. Social worlds and arenas can be conceptualised as a merely “extended situation” (Clarke, 2003, p.126) whose comprehension requires looking “at their embeddedness in a larger negotiated order” as “one cannot understand a social world in isolation” (Clarke, 2003, p. 138). In social worlds, groups of actors and individuals share commitments, activities, resources, goals and sometime build ideologies that can be explored by focusing on how issues are debated, negotiated, fought out, forced and manipulated (Strauss, 1978). The literature is rich in examples of SW/A theory applied as a framework to discuss negotiations, conflicts and ideologies in health policy (e.g. Garrety, 1998; Karlberg, 2000; Neilson et al., 2013), cultural studies (e.g. Salin & Pesso, 2017), knowledge production and applied research (e.g. Andersen, 2014; Lin, 2011), business (e.g. Vasconcelos, 2007), etc. In section 2 we have illustrated how DIY science is regarded in the literature from a variety of viewpoints that sketch out its multiple faceted characteristics sometimes made of different relations among individuals, the collective, organisations and institutions. We believe that the theory of SW/A can offer a solid methodology to analyse DIY science’s discourse material, irregularities, contestations, contradictions and fragmentations. We illustrate possible understandings of DIY science using maps. Clarke (2003) discusses the usefulness of analysing situations using maps as they “open up knowledge spaces, [...] are great boundary objects-devices for handling multiplicity and heterogeneity…” and “are excellent devices to materialize questions” (p.30). Therefore, in order to assess the usefulness of mapping SW/A in the context of DIY science, we looked out for collective commitments, relations, and sites of action within the phenomenon. In our context, social worlds become dedicated physical and virtual spaces such as makerspaces, Fablab and online communities, platforms and blogs and not least, events and occasions of interface among DIY scientists and institutions (e.g. conferences, university events, and sponsored tech-fairs). In these worlds we sought for how groups and individuals interact with distinct sets of norms, values, beliefs, communication styles, standards and language. In the attempt to shed light on the actors’ involvement in their social worlds, we departed from the actors’ proximity to the activities of their social worlds and the knowledge of their functioning. In order to investigate DIY science and its involvement in different social worlds and arenas we designed a dual approach made of a field research phase and an auto-ethnographic phase. The first, which consisted of in person visits and participation to some activities typical of the DIY science scenario, revealed fundamental in informing the second phase, which focused instead on our personal involvement in a DIY biology project about the assessment of food quality. While the principal scope of the first phase was the identification of the social worlds of DIY science and their network placement, the second phase allowed in depth reflections on first hand practices and interactions in a particular project setting. 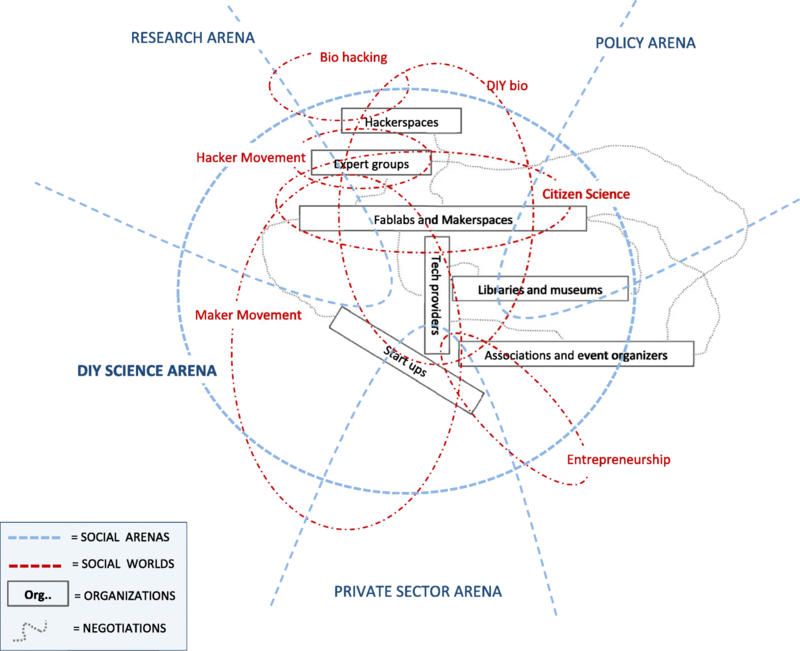 The main scope of the first phase was to probe the DIY science arenas and identify its main actors and groups, which we later catalogued in worlds and sub-worlds according to the theoretical framework of SW/A. We visited three spaces across Europe: two Fablabs14 in Switzerland and Italy and one collaborative space in the Netherlands over different periods in 2016 to 2017. We actively took part to the spaces’ daily routine and directly observed DIY scientists work practices and their inter-relations and collaborations. Visits lasted a total of 6 working days (Table 2). Additionally, we also attended two international events in Italy and France in 2016 over a total of 7 days. Such meetings gather the DIY community on themes such as innovation, science and the future, and are highly informative of the established communication networks (Table 3). European reference event of the Maker Movement. Participants showcase their projects and engage among themselves and with the visitors. Principal event of an international NGO. Gathers innovators, entrepreneurs, tech enthusiasts and scientists around specific themes that are discussed in talks and plenary discussions. During our field research, we wrote accurate descriptions of the observations and additionally carried out few open ended interviews with key actors in informal sessions around specific topics of discussion. We consulted conference programs and therein contained references to additional DIY activities and spaces, with the objective of compiling a basic social network map. Subsequently, we retrieved additional documents and material publicly online (organizations and associations websites) to enrich and confront our data. Typically, our observations revolve around how participants articulate discourse over the DIY movement, how they jointly organise work and establish communication within their group and towards the external. Prototyping of different practical possibilities. Fig. 1 shows an. 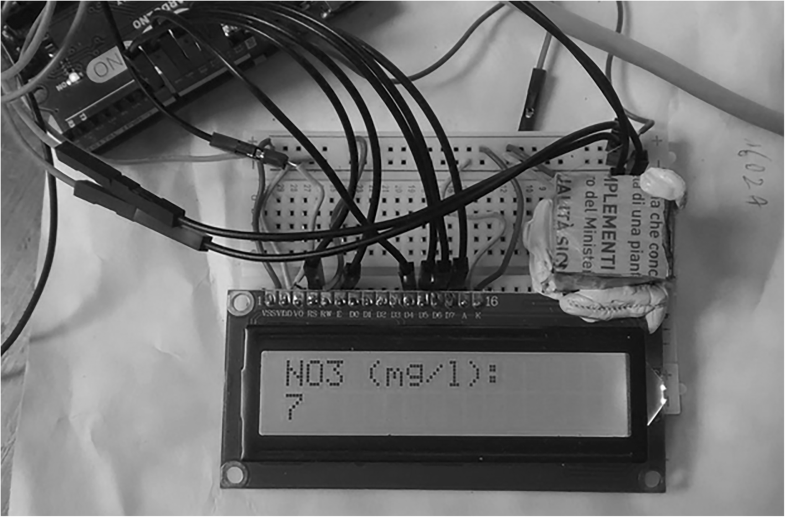 Arduino based kit for the detection of nitrite/nitrate in food samples. A TCS3200 colour sensor in a controlled dark room is employed to read commercially available test strips.s In a second stage we investigated the reproducibility of these strips through DIY means, although we did not proceed with the actual realization. Data analysis consisted of transcribed annotations, as well as blog activity and personal written and oral communications. Data were collected in transcripts and treated with QDA® miner software which allows categorization and coding as well as intelligent retrieving of content. We created several entries with information on the actors, spaces, personal communications and interactions object of our study and collected during both of the above described research phases. These include geographical location, date, technical characteristics, organizational aspects, legal context and personal observations of the visited spaces, as well as demographic and background details, activities, formal commitments and transcripts of communications or statements of the actors we interacted with. We analysed recurring themes along the principles of grounded theory as displayed in Charmaz (2006). We grouped and named the descriptive codes via software, next to the main topics of the treated excerpts. This process drew the basis for the production of Tables 5 and 6. The question guiding our inquiry into DIY science is: what are actors’ actions and commitments that describe the social worlds operating in the context of DIY science? Strauss (1978) argues that social worlds and arenas refer centrally to universes of discourse (p. 121) and it is precisely after the articulation of discourse that we posed our attention when analysing our research data: how do actors articulate views on DIY science and on the actions of their worlds? How are affiliations, memberships and relations built and sustained within groups, associations, communities and organizations? After analysing the actions of the actors selected from our field research, we were able to draft a tentative pool of the SWs of DIY science. We unpacked some of these SWs according to the descriptive guidelines of Clarke (2003, p.115). A summary is presented in Table 6, which we subsequently used as a basis for possible mappings of DIY science. For each SW we collected the main commitments as they have been articulated by the actors in Table 5, accompanied by the diversity of descriptions of the worlds, the actions, technologies taking places within different sites and, possibly, organizations. After identifying the main constitutive SWs of DIY science, we are ready to aggregate them in arenas. Clarke (2003) offers a number of indications to be checked against when taking the arena mind-set (p.124). In Table 7, examples of these criteria can be found based on the conceptualisation of DIY science as a potential arena of interest. These criteria are generally valid for thinking about any social arenas. Our literature review shows multiple perspectives over the DIY science phenomenon, as well as its multi-faceted intrinsic nature. DIY science contains different actors and collectives that respond to different cultures and practices. No actors at both research phases stressed the prevalence of any SW against others. We think this could be the case of DIY biology or other SWs within DIY science (e.g. IT hacking, the Maker Movement, etc.). We explore this possibility by offering two distinct possibilities of mapping. The reflection on our situational elements can result in different possibilities of mapping the arenas of DIY science. One possibility might originate from selecting “DIY science” as the arena containing the totality of the SWs described in Table 6. However, along the third criterion in Table 7, nothing prevents us from deconstructing single SWs into arenas on their own. In all cases, boundaries between arenas are to be considered flexible and porous (from which, they are represented by dotted lines). The analysis of the self-descriptions of the SWs of our study suggests that some SWs are typically conceptualised in different ways by different actors (see Table 6). We took the case of the Maker Movement, around which there are abundant viewpoints and stances, both in our empirical material, as well as on the Internet. 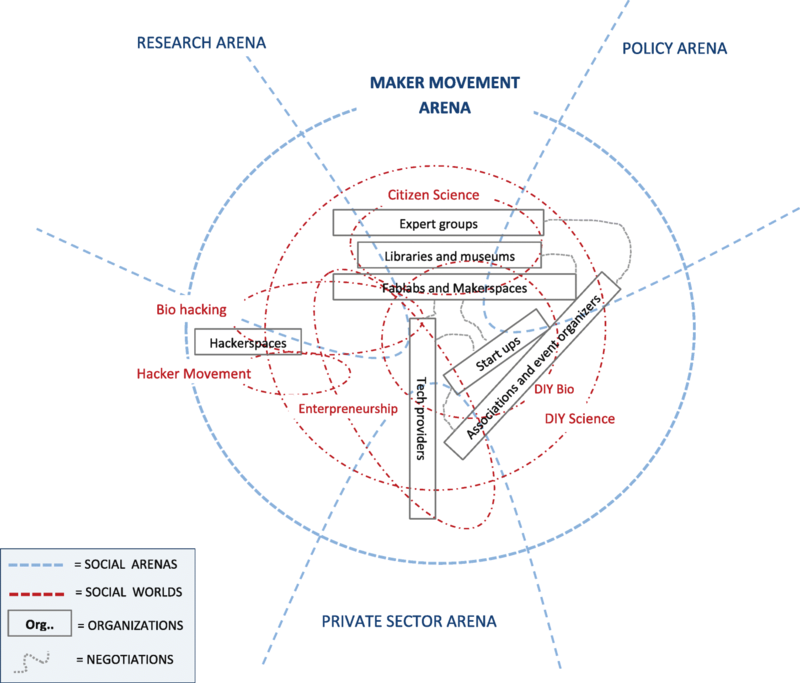 We investigated how different conceptualization of the Maker Movement can lead us to different mappings of DIY science: Map 1 (called “the Maker Movement arena”) and Map 2 (called “The DIY science arena”) follow from differences that have emerged in our first field research phase in the discourse about the Maker Movement. In a first possibility, the Maker Movement alludes to the “DIY empowerment” paradigm of everyone that operates creative skills to design and make objects, as well as applies peer-to-peer based learning to solve problems. From such view, makers can also be individually active, since no particular reference is made to their operational centres, neither to their specifically employed technologies. “Making” is depicted as something that has always existed, as it does not depend on the technological aspect, rather on a cultural mind-set (see e.g. Burke, 2014). In other words, someone fiddling around broken electronics in their garage could be considered a maker by all means. Surely akin to the counterculture of the 60s an70s, this conceptualization of the Maker Movement sometimes recalls a moral critique to the passivity of consumerism societies (see e.g. Smith, 2014) This is mirrored, for instance, in the words of Actor 5 of the first phase (see Table 5), who stated that “makers aren’t just people who create objects; it’s everyone experimenting with new ways of living”. A private consultant (Actor 3) from phase 1 discussed makers as “those who are affiliated to either a makerspace or a Fablab”, while a Fablab director (Actor 6) recalled that “typically when you plan initiatives, you are targeting a specific community that has its reference events in fairs and its location in the Fablab network”. With this example we see howthe discourse about the Maker Movement is thus performative in generating different options of mapping social worlds and arenas, and thus indirectly, conceptualizing DIY science. We tried to exemplify this through Map 1 and Map 2, which were obtained adopting the graphical standards of SW/A mapping presented in Clarke (2003). According to Map 1 not all makers are necessarily DIY scientists (as people fiddling around broken electronics are also makers), while all DIY scientists are also makers (as they adopt a DIY paradigm). This is no longer the case in Map 2, where the Maker Movement is made to coincide with the institution of makerspaces, Fablabs and community spaces, as we might assume that some DIY scientists are active outside specific communities of practice or networks, e.g. individually in their private labs. Situational maps are a powerful tool to explore the social situatedness of complex phenomena such as DIY science. We have shown that the analysis of discourse circulating on DIY science can lead to different possibilities of conceptualizing its situational elements. Why are Map 1 and Map 2 both equally plausible and legitimate? What are the consequences of such potential plurality? Clarke (2003) asserts that “social worlds are universes of discourse in arenas constituted and maintained through discourse” (p.114). From an analyst standpoint, discourse thus becomes performative in creating certain social worlds and arenas against others. Consequently, notions of particular social worlds and arenas directly derive from the articulation of discourse: discussing DIY science indirectly co-creates its situatedness, which is not free from risks of blind assumptions, unmotivated statements and factual misconceptions. In an article on the development of discourse about ‘buzzwords’ and ‘fuzzwords’, Cornwall (2007) stressed how “words make worlds”, alluding to how language itself animates and justifies intervention with promises of what is deemed possible. Policy spheres are rich in examples of use of specific notions of DIY science that not always reflect the views of actors within the DIY community. A summary of a held session entitled “European Stakeholder Round Table on Citizen, DIY Science and Responsible Research and Innovation” carried out by the European Citizen Science Association (ECSA) states “funding, recognition of legitimacy and better links within the research community” as the “immediate problems” that DIY and citizen science groups are facing.22 Such understanding is not quite shared by some of the actors encountered during our auto-ethnography. First, the community of DIY biologists, with its online reference portals, lacks of a clear and unified objective, due to the high diversity in the practitioners’ expertise and aspirations. In the field of spectrometry, for instance, one shared goal is to specifically maximize and improve inexpensive techniques in order to allow the flourishing of a collaborative network completely independent from institutional funding and regulation. Second, different visions underpin interest in food quality assessment. For example, our project on the DIY screening of nitrates/nitrites concentrates in food samples was well received both internally our research centre, by our colleagues in the field, as well as by the wider DIY community. However, we noticed how professional scientists have tried to accommodate our proposal to develop a DIY sensor somehow including it in the list of their institutional deliverables, aiming to integrate their already existing work with a DIY approach. While pre-fixed objectives seem to be the norm and driving force in formal institutions, practitioners not institutionally affiliated not always consider that what applies to institutional research has to be relevant in DIY science premises. Indeed, independent DIY scientists typically seemed keener to explore the topic independently from the supposed scientific importance and implications. Such issue of generalization was rendered visible by a lab technician employed in our research centre: while he could not find much space for accommodating our project into his professional activity, he showed remarkable interest personally as a private citizen, to such an extent that he asked to be involved in the project outside his working time. Professional identity plays a key role among DIY scientists. A survey published by the Woodrow Wilson International Centre for Scholars 23, showed that in 2013 approximately a third of participants of the DIY Bio community biology held PhDs and had positions in a government-funded or privately-owned research institute. The fact that ours was an institutional project caused mixed reactions both internally and outside the research centre. Typically practitioners foresee participation with different perspectives according to whether DIY science projects are presented in a professional environment rather than in informal premises, such as a garage or a local makerspace. DIY science is frequently constrained by practical and technical limits. The development of our sensor revealed that infra-red spectrometry is hard, if not impossible, to be conducted without the advantages of professional laboratories. Conversely, while this was interpreted as a point of failure of the DIY approach by colleagues in mainstream research, the online community of amateur biologists considered it as a positive achievement, whereby the added value of the DIY paradigm resides in the entire process, made of freedom of exploration, as well as pure entertainment. It comes straightforward that different attitudes towards DIY science would translate into different possibilities of mapping the very same actors: is he a laboratory technician, a free time DIY biologists, or both? Every account on DIY science should carefully take into consideration what particular notions of DIY science are selected by policy, media and the community and for which purpose. Whenever the discourse culminates with direct or indirect conception of close ended notions, attention must be paid to their possible implications. In designing funding campaigns aimed at supporting economically the Maker Movement, for instance, a policymaker could either rely on Map 1 or Map 2 (or even others). If one assumes Map 1, additional social worlds and their actors (e.g. citizen scientists, or start-ups) should be included in the coverage of the investment, as they are part of the broader Maker Movement arena. According Map 2, these same social worlds might end up being excluded or only partly targeted (e.g., “not all citizen scientists are makers”). Different notions of DIY science and its social worlds therefore lead to different situational options, which in turn can have implications in terms of potential exclusion of relevant actors, missed opportunities, and even instrumentalisation for hidden agendas. DIY science is bound to remain an unstable etity, perhaps even an “essentially contested concept” (drawing from Gallie, 1956), similarly to what recently suggested by Korhonen, Nuur, Feldmann, & Birkie (2018) about the notion of “circular economy”. Every use of DIY science in public discourse should therefore be accompanied with detailed information about the situational elements it entails, and a careful contextualization of its social worlds and actors. Only in such a way can we try to avoid the risk of appropriation and instrumentalisation of DIY science without consideration of the complex multitude of interests, imaginations, expectations and assumptions it embeds. With the present study we demonstrated that no definition of DIY science taken alone is meaningful or fully comprehensive of the variety with which DIY science expressions have emerged and shall emerge in the future. DIY science becomes “objectified” as an entity of discourse as soon as it gets articulated through discourse. By applying the theory of social worlds/arenas we were able to show how more conceptualisations and interrelations of DIY science are possible and legitimate at the same time. This has important ontological consequences as soon as DIY science becomes a topic of discussion in research, policy and governance. Are, for instance, individually active so-called “biohackers” also DIY scientists? Taking “DIY science” as unique and stable inevitably leads to major reductionisms that can range from epistemic exclusions and indirect facilitation of some worlds (groups, communities, organization, institutions), to the misrepresentation, myth and hype about the real scientific implications of DIY science. In relation to such reductionisms, Clarke (2003) says that “because social worlds/arenas attempt to represent most if not all of the major social worlds […] the analyst grants greater power to the less powerful worlds (p.124)”. With our auto-ethnography, we exemplified how in the case of DIY Bio, some communities tend to be moved by different concerns for action than those of institutional worlds, although the visibility and outreach of their practices is set on a totally different scale. 2015 survey-based study by the Pew Research Centre and the American Association for the Advancement of Science (AAAS) highlighted how in the United States a considerable opinion gap still exists between the general public and scientists on a wide range of science and technology topics, for instance, climate change and human activity or favour use of animals in research. http://www.pewinternet.org/interactives/public-scientists-opinion-gap/. Retrieved 30/05/2018. When performing this literature review, we were expecting a greater deal of papers concerned with the education and learning aspects of DIY science. Around the topic of maker movement, education and learning occupy the larger share of scholarly contributions. https://www.theguardian.com/higher-education-network/blog/2014/jun/16/diy-labs-exciting-alternative-university-science-research. Retrieved 22/02/2018. The Guardian launched a dedicated blog called “Academics Anonymous”, devoted to give voice to scientists and let them “tell it as it is”. See e.g. https://ecsa.citizen-science.net. Retrieved 02/03/2018. The Horizon 2020 framework program alludes to promote “citizens’ interests and capacities for science allowing them to actively participate in various scientific activities (e.g. exhibitions and science cafés, grass roots “Do It Yourself” (DIY) creative re-use communities, on-line mechanisms for knowledge-based policy advice)” (European Commission, 2017, p. 21). Online Etymology Dictionary: https://www.etymonline.com/word/situation. Retrieved 09/03/18. For details about what is a Fablab please refer to http://www.fablabni.com/what-fablab.html. Retrieved 13/03/18. Joint Research Centre of the European Commission (JRC). See https://ec.europa.eu/jrc/en/research-topic/food-and-feed-safety. See e.g. http://nypost.com/2016/07/10/the-truth-behind-how-were-scammed-into-eating-phony-food/. Retrieved 16/04/2018. https://www.nytimes.com/2014/09/19/opinion/taiwans-gutter-oil-scandal.html. http://www.bbc.com/news/world-asia-29249180. Retrieved 17/03/18. Extracted from http://www.hult.edu/blog/an-overview-of-the-maker-movement-what-is-it-and-why-now-part-1/ Retrieved 12/04/2018. The author would like to thank Ângela Guimarães Pereira and Harro Van Lente for their useful comments and suggestions. Scopus search specify available upon request. Other data cannot be shared due to impossibility in anonymizing the transcripts, which contain a lot of personal information. The views expressed in the article are purely those of the author and may not in any circumstances be regarded as stating an official position of the European Commission. The author read and approved the final manuscript. The author accepts the publishing terms and conditions of the journal. Austen K. Out of the lab and onto the streets. New Scientist. 2013; https://doi.org/10.1016/S0262-4079(13)61628-0. Bardaji R, Sánchez AM, Simon C, Wernand MR, Piera J. Estimating the underwater diffuse attenuation coefficient with a low-cost instrument: the KdUINO DIY buoy. Sensors (Switzerland). 2016;16(3) https://doi.org/10.3390/s16030373. Busch JA, Bardaji R, Ceccaroni L, Friedrichs A, Piera J, Simon C, Thijsse P, Wernand M, van der Woerd HJ, Zielinski O. Citizen bio-optical observations from coast- and ocean and their compatibility with ocean colour satellite measurements. Remote Sens. 2016;8(11) https://doi.org/10.3390/rs8110879. Charmaz, K. (2006). Constructing grounded theory: a practical guide through qualitative analysis. Book (Vol. 10). https://doi.org/10.1016/j.lisr.2007.11.003. Cressey D. PhDs leave the ivory tower. Nature. 2012; https://doi.org/10.1038/484020a. Karlberg K. The work of genetic care providers: Managing uncertainty and ambiguity. In: Health Care Providers, Institutions, and Patients: Changing Patterns of Care Provision and Care Delivery (Vol. 17, pp. 81–97): Emerald Group Publishing Limited; 2000. https://doi.org/10.1016/S0275-4959(00)80040-X. Kumar, P., Morawska, L., Martani, C., Biskos, G., Neophytou, M., Di Sabatino, S., … Britter, R. (2015). The rise of low-cost sensing for managing air pollution in cities. Environ Int https://doi.org/10.1016/j.envint.2014.11.019. Nascimento S, Guimarães Pereira Â, Ghezzi A. From citizen science to do it yourself science; 2014. https://doi.org/10.2788/12246. Newman G, Wiggins A, Crall A, Graham E, Newman S, Crowston K. The future of citizen science: emerging technologies and shifting paradigms. Front Ecol Environ. 2012; https://doi.org/10.1890/110294. Trumbull, D. J., Bonney, R., Bascom, D., & Cabral, A. (2000). Thinking scientifically during participation in a citizen-science project. Sci Educ, 84(2), 265–275. https://doi.org/10.1002/(SICI)1098-237X(200003)84:2<265::AID-SCE7>3.0.CO;2-5. Wexler A. The social context of “do-it-yourself” brain stimulation: Neurohackers, biohackers, and Lifehackers. Front Hum Neurosci. 2017;11 https://doi.org/10.3389/fnhum.2017.00224.